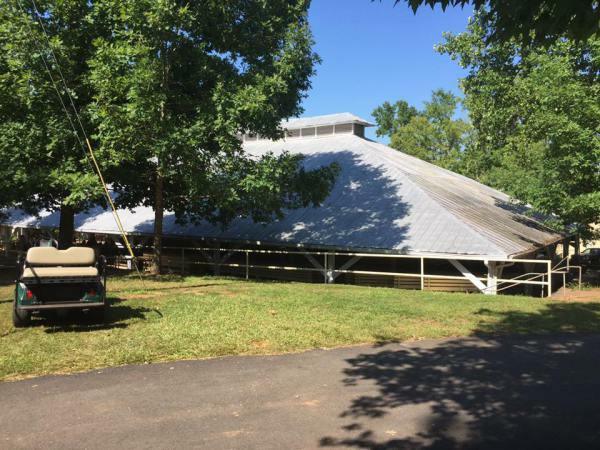 When the heat of summer blends with the sweet sounds of old hymns sung by the faithful to the beat of handheld fans, it can only mean that camp meeting is back in town. Yes, it’s Camp Meeting time again, that holdover from generations ago that speaks to us in the voice of that era in a way that is still remarkably relevant and timely today…especially today. What is it about a camp meeting that tugs at the heartstrings of nostalgia and brings back distant memories that still come through so clearly today? Is it the smell of freshly mown grass and the way the setting sun filters through the nearby tress, a scene that could be today or decades ago? Is it the familiarity of the hymns, the same ones sung from memory that we sing in our churches, yet which are profoundly different when sung with joy and the voices of many in a huge outdoor setting? Is it the sermons, spoken by powerful orators that never, despite the heat, seem to get overly hot or prematurely exhausted in their exhortations? I think it is all of that, because it is both changing and unchanging. Time may march on but Camp Meeting seems to linger for a bit, slowed and weighted down with its sights, sounds, smells and memories, taking us along with it, allowing us to move at a more leisurely pace, to take stock of life and all that is a part of it. That is not the way I always saw it at the time it was happening, but as time has gone by, it’s the way I remember it now, and all it takes is a trip down to Indian Springs to get in touch with that past again. I do remember it as a happy occasion though, because camp meeting always coincided with a visit from my grandparents and that was enough to make anything a special event. My grandfather was raised in the foothills of the North Georgia mountains at a time when camp meetings, tent revivals and small country churches were as common as a Dollar General store is today. Poor farming folks usually did two things in life; work hard and go to church, and by extension, to revivals and camp meetings. These not only afforded them the opportunity to spend time together socially and bond as a community, but to worship, pray and sing together, to revive their spirits and to equip themselves with the spiritual armor that they needed to get through long days and hard times. My grandfather never lost his love for camp meetings, and after he became a Methodist minister, he pastored small churches in rural areas that, more often than not, would hold revivals. He still enjoyed traveling to the various camp meetings to worship with others, to sometimes lead services and to recharge his own spiritual batteries. When he pastored our family church in Jackson, having one of the largest camp meetings in Georgia just a few miles down the road was something he couldn’t pass up and for many years after he moved on to other churches, he would still make the time to come back and experience the Indian Springs Camp Meeting and I would usually go with him to services held under the large, open air tabernacle that has stood at the center of the campground for well over a century. He always saw someone there that he knew. Sometimes it might be a parishioner from one of his previous postings or other people like him that drove down to attend a session or two, but more often it was one of the regulars, those who owned cabins around the tabernacle and who were mainstays at the annual event, moving in for the week and a half the meeting took place. He usually liked to get there a little early so he could visit with people who were always warm, friendly and genuinely glad to see you, whether they did know you or not. The evening services were always the best ones to me because the temperature was almost bearable. We would sing the old hymns by Charles Wesley and his peers, the same ones you had always sung in church and knew the words to, mostly. Someone always led and if you weren’t singing loudly enough, they’d get you pumped up with their waving arms and a voice loud enough to carry over the din. My grandfather was a much better speaker than he was a singer but this didn’t stop him from giving his all. Finally, exhausted, we would sit on the long wooden benches as the speaker came forward. He might begin somewhat softly, even trepidatiously at first, but sooner or later, he warmed to the subject, taking us through a story or on a journey, his voice rising and falling and we travelled through the low valleys of death and despair up onto the high mountains of joy and redemption, all through the power of God, the love of Christ and the presence of the Holy Spirit. You could almost see the Spirit at work in him as he went on, indefatigable in his mission to get the message through to us. As a child, I would get lost as the sermon progressed, easily distracted by what was going on around me. People would fan themselves with whatever they had, be it a program or a book, a hat or a fan. Butterflies or bumblebees would fly by and it was fun to watch and see how far you could follow them before you lost sight among the lush green trees that were close by. While I might have lost the plot on the sermon from time to time, enough of it apparently sunk in and I could usually recite a few things later that I had heard. Eventually it would come to an end, and following another hymn or two, it would be time to leave. Folks didn’t rush out like they usually do at church though, because Camp Meeting was also a social time and many would linger and talk about the sermon, the music, their families and what so and so had been up to lately. It was an idyllically southern setting, this camp meeting of then and is still very much so today. Much has changed in our world and sometimes we wonder whether those good days will ever come back…but for ten days each year, in a beautifully secluded part of Central Georgia, we can still find a piece of the past, still intact in ritual and deeply rooted in many who remember it. For those who’ve never been to one, its a treat to experience it and a good way to revive your spirit. I miss going with my grandfather to the Camp Meeting and some years I don’t get to make it there myself, but when I do, I can feel his spirit there and those of the great chorus of saints who have worshiped under the welcoming embrace of the old tabernacle and I feel revived and refreshed once again.